Colleen Richardson has loved dolls since she was old enough to hold one, so it seemed only natural to rekindle that passion when she retired in 1991 from her job as teaching principal at Two Rock Elementary School. 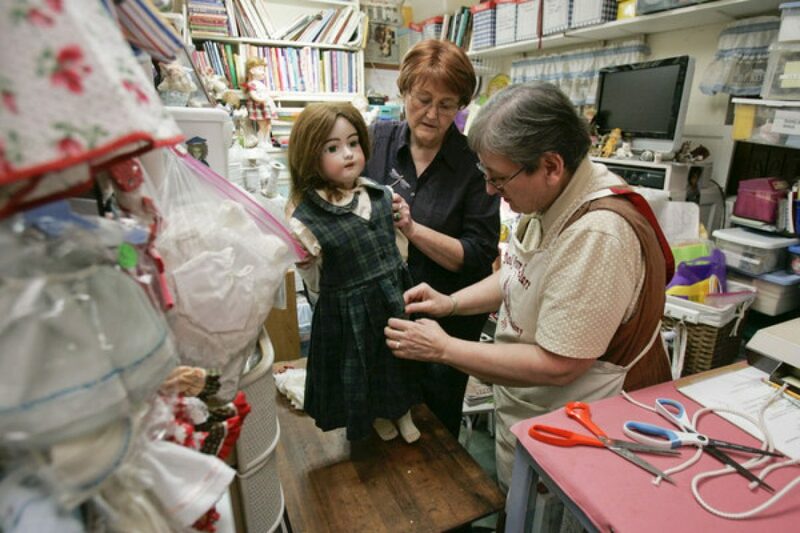 Instead of really retiring, she opened The Doll Mercantile in Petaluma and has been collecting and repairing dolls ever since. From her shop at 1510 Bodega Ave., Richardson sells everything from Raggedy Anns to Shirley Temples, Harry Potters,AmericanGirls and antique dolls from around the world. She also stocks doll clothing, accessories, furniture and supplies. But her real bread-and-butter business is building reproductions of antique porcelain dolls and Teddy Bears, and fixing other people’s family heirlooms. On busy days, a line of customers and their keepsakes winds through the store. Some want Richardson to research the history and value of their dolls. Others clutch nostalgic favorites that have been in the family for generations, hoping that she and her two helpers can bring them back to life. 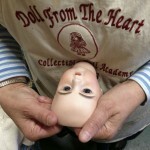 A friend who owns Dolls from the Heart in Santa Rosa helps by manufacturing the porcelain parts for new and used dolls. 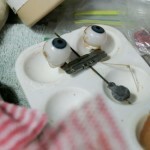 Donna Larsen works to set a doll’s eyes. Doll parts at The Doll Mercantile in Petaluma include movable eyes. Owner Colleen Richardson, left, and Donna Larsen work putting together an antique doll made by Simon Halbig sometime between 1890 and 1910 and valued at between $2,000 and $3,000. Owner Colleen Richardson measure the size of an antique doll made by Simon Halbig sometime between 1890 and 1910. Owner Colleen Richardson, left, and Donna Larsen work on an antique doll.